To quote Ru Paul, “If you can’t love yourself, how the h*** you gonna love somebody else?” Coming from the foremost arbiter of an art form that trades in irreverence, the naked sincerity of these words is surprising and somewhat revolutionary in pop culture. Of course, Ru certainly isn’t the first to understand that loving and accepting oneself is the first step to loving others. 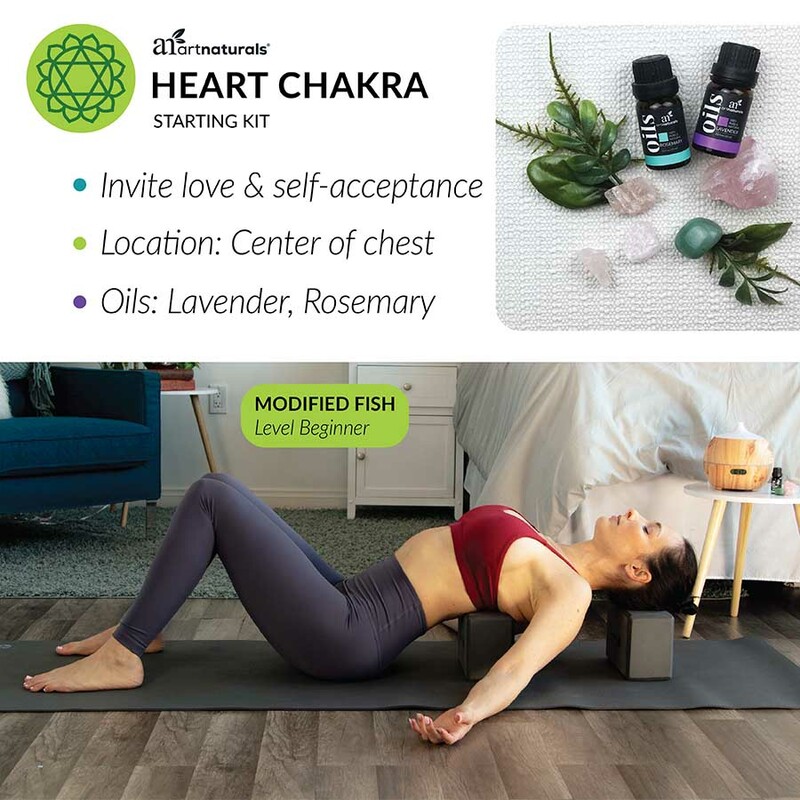 Using yoga, meditation and other tools, like essential oils, to open your heart chakra is a mindful way to start inviting more love and self-acceptance into your life. What Are Chakras, and Why is the Heart Important? Consider chakras the anatomy of your personal energy. Similar to how your body is made of bones, and muscles, your energetic self also has specific anatomical parts. Your energetic anatomy consists of breath/energy (Prana), the paths through which energy and breath flow (nadis), and centers of energy (chakras). Your heart chakra is located in the center of your chest and is represented by the color green. Just as it’s more difficult to walk with a broken bone in your leg, broken or blocked chakras can affect different areas of your well-being. The heart chakra fittingly correlates to relationships, love and self-acceptance. Feelings of being closed down and withdrawn or issues with undue jealousy and codependency are often associated with a blocked heart chakra. Experiencing these feelings makes it difficult to relate to others, presenting emotional obstacles to love for yourself and others. What Essential Oils Are Good for the Heart Chakra? Our favorite essential oils for supporting work with the heart chakra are rosemary and lavender. Both of these herbaceous top note essential oils can be used individually, together, or in any number of blends. Rosemary essential oil is traditionally used for cleansing, consecration and peacefulness. Associations with circulation and connection make this essential oil perfect for work with the heart chakra. With its strong connection to sensuality and sexual desire, lavender essential oil is especially good when your intention is opening your heart to romantic love. One of the best essential oils for relaxing, lavender can also encourage releasing tension to allow your nadis to unknot. Whether diffusing, making your own aromatherapy massage oil, or blending with a carrier for personal application, essential oils can be instrumental to supporting balanced and stimulated chakras. Setting an intention for your meditation or yoga practice can help you cultivate and amplify the energy you want to project and receive. Using essential oils and chakra stones in your practice can help you set your intention. Diffusing rosemary and lavender essential oils while you practice creates an atmosphere that encourages your heart chakra to open. Using these essential oils also demonstrates your intention to invite love for yourself and others. Practitioners of modern crystal healing use rose quartz and green aventurine to balance and regulate heart chakra energy. To help set your intention to invite love, use these crystal gemstones as a powerful visual reminder of your intentions. To further open and amplify the energy of your intentions you can also embrace the color of the heart chakra. Wear clothing or jewelry in shades of green or surround yourself with green objects as a visual reminder of your intention to absorb and project loving energy. Carrying your chakra stones with you is a simple way to take your goals with you into the world as you leave your practicing space. Deepen your intentions by also wearing lavender and rosemary essential oils in a roll on blend and programming your chakra stones to your specific purpose. Instructions: Use your funnel to fill the rollerball bottle with 2 tsp of jojoba oil. Add 4 drops rosemary essential oil and 3 drops each of lavender and sweet orange essential oils. Add rollerball applicator, cap tightly and shake to mix well. To use, roll on heart chakra essential oil blend to pulse points, back of neck and temples. 1.Take a few deep breaths, clear your mind and relax. 2. Hold your rose quartz and aventurine gemstones in your hands and declare your intentions out loud. 3. Place one stone at your third eye and visualize your intention. Imagine your intention becoming a reality and feel as though your intention is already a truth you are living. 4. Hold the same stone over your heart and say a sincere “thank you” for the opportunity to begin your journey to realizing your intentions. 5. Repeat steps 3 & 4 with the other stone. 6. Take a deep breath and you are finished. In the anatomy of your energetic self, the heart chakra radiates from the center of the chest. Yoga poses that stretch and flex the muscle groups in the chest also help stimulate and balance the heart chakra. 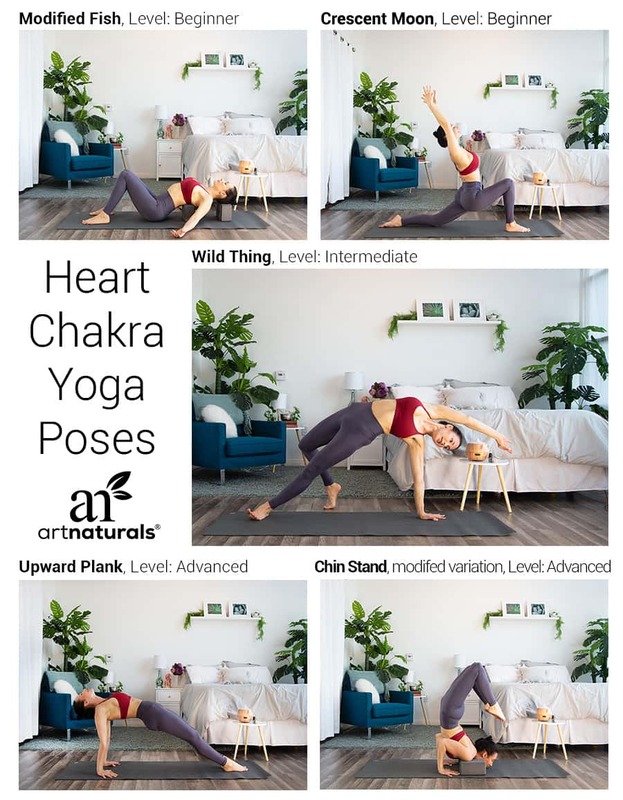 Yoga teacher, Sheryl Utal, has shared some fantastic heart opening yoga poses for any level of yoga practitioner. For beginners, she suggests the modified fish pose (matsyasana) and crescent moon (anjaneyasana). Intermediate practitioners may enjoy incorporating wild thing pose (camatkarasana) in practice centered on the heart chakra. Upward plank (purvottanasana) and variations on the chin stand (ganda bherundasana) may be incorporated into more advanced practice. Of course, attempting new yoga poses should always be done with the guidance of an experienced teacher. Special yoga classes, like Sheryl’s Reveal Your Heart session February 14th at Red Diamond Yoga, can help with severe heart chakra blockages or simply begin you on your journey to inviting more love and self-acceptance into your life. For daily inspiration and more thoughts on using yoga practice for emotional well-being you can find Sheryl Utal on Instagram. For everything essential oils, be sure to check out our YouTube and Facebook pages. Connect with us in the comments to share questions, your thoughts about opening heart chakras, using essential oils in your yoga practice, or anything else!